Monday 8/27 – We have phys. ed. Please send the kids to school wearing comfy clothes and sneakers. We’ll share a few “all about me” bags each day this week. Students will be learning about our “morning tubs.” Activities they may explore with a friend in the morning before the 9 AM bell rings. Tuesday 8/28 – Our special is Art. We’re going to be practicing our “read to self” stamina. We’re making a special craft for you to see tomorrow night. We’ll be playing a math game to learn how to instantly recognize numbers on dice without counting them. Wednesday 8/29 – We have applied engineering. We’re practicing our handwriting by reviewing how to make uppercase letters properly. We’re also practicing our numbers. Students will learn how to read using pictures and we’ll practice our 1-1 pointing. Please drop in today between 4PM – 6 PM. Students are encouraged to come along and show you our room! I have a special project for parents to complete. Thursday, 8/30 – Our special is Music. The kids were so nervous last week to go to music! Some of them were worried because they don’t know how to sing! Oh how sweet! We’ll be practicing our writing and learning how to label a picture. Today will be the first day we count our “golden tickets” and buy reward coupons. It takes 10 golden tickets to buy a coupon. My friends have had a lot of great behavior to earn many tickets! This is such a sweet class! We have a 1:30 early dismissal today. Please contact the office if your child will be going home a different way than usual. Tuesday, 9/4 – Send those smiling kids back to school! Our special will be phys. ed. Have the kids wear sneakers and comfy clothes. Boy did we have a great first day! 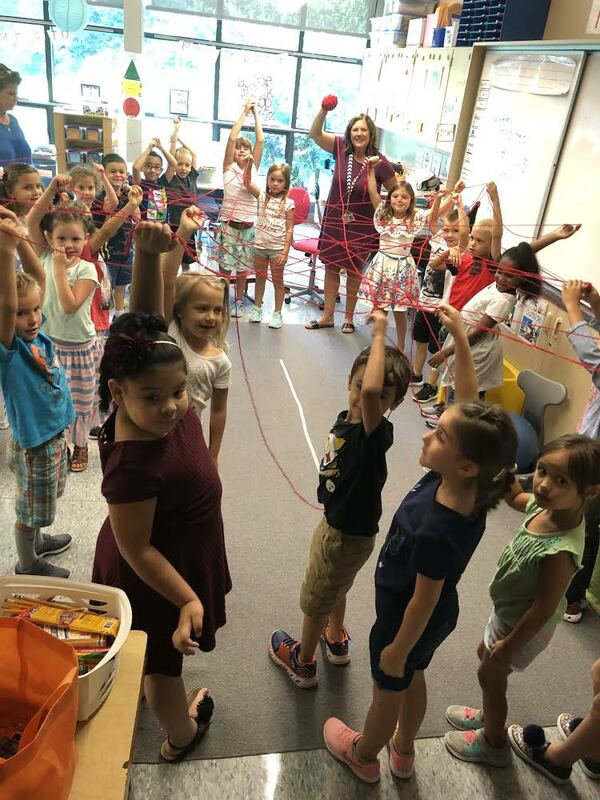 My friends enjoyed going on a scavenger hunt to find Pete the Cat, playing a “jump over the line” game, and using yarn to share our names. Please check your child’s “Froggy Folder” tonight for some parent homework! Students at Eshleman are dismissed as walkers, YMCA, bus riders or car riders. Please be sure to clearly communicate your child’s dismissal plans to the office via email, or a phone call. If we do not hear from you otherwise, your child will be sent home on their assigned bus or as a walker. If your child will be a car rider, or goes to the YMCA after school program, please communicate that information to our secretary (jennifer.rohrer@pennmanor.net). This will ensure your child is sent home the correct way. Thanks! We’re in search of a parent who would enjoy coming into our room (in the Spring) as a JA volunteer. Volunteers talk to our class about living in a community, having a job, and wants vs. needs. The curriculum is already written, and the supplies are provided by JA. Lessons usually last about 45 minutes. If you would like to know more, send me an email and I’ll give you the JA coordinator’s email. She can answer your questions and explain more about what you would do. First graders are a very enthusiastic audience. Thanks for your consideration! Parents are welcomed to send a change of clothes along to school for their children. This clothing could be used in the case of a bathroom accident or a fall on the playground that results in wet or muddy clothing. The children are more comfortable wearing clothing of their own that is just their size. Clothing may be sent to school in a plastic bag labeled with your child’s name. We’ll store it in our cubbies. I’ve already subscribed some parents to the blog for the 2018-2019 school year if I was able to locate an email address for you, WELCOME! Letters to students have been mailed and should be arriving early next week! Our first day of school is on Thursday, August 23. I’ve enclosed a name tag in my welcome letter for the children to wear on the first day of school. I’ll be wearing a matching one so we can easily recognize one another on the first day of school. Students are welcome to bring a small stuffed animal that fits into their back pack on the first day of school. It’s always nice to have a friend with you! I have plenty of pencils, scissors, hi-liters, and folders that I’ll be sharing with the class. Donations of tissues and hand sanitizer are always welcome. D lunch – yogurt and string cheese. We’ll rotate through the specials each week. Sometimes we’ll have the same special two times in one week. You’re invited to join us in our classroom for a drop in from 4-6 PM. Come see your child’s classroom and stop in to say hello! Tuesday, 9/4 – Send ’em back to school! Our special will be Phys. Ed.